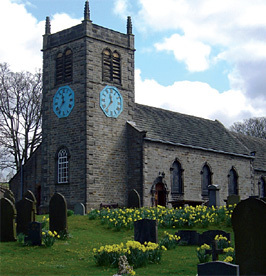 St. Peter’s Church in Addingham has been a Christian site since Saxon times. Archbishop Wulfhere of York fled here for sanctuary in AD867 when the Vikings invaded that city. Over eighty graves of our Saxon-age ancestors were discovered during three archaeological digs between 1998-2006. In July 2005 advisors from English Heritage encouraged the church to put together an application for a grant which would cover a diverse range of activities to celebrate the rich heritage of the church and its “environs”. A year later the church was awarded a grant of £24 942 by The Local Heritage Initiative / Heritage Lottery Fund to enable it to explore and celebrate our Christian Heritage and the part it plays in our village and regional life. A major condition of the grant was that it should be matched by an equal amount of ‘volunteer hours’ . In total volunteers contributed 570 working days based on a 7 hour day. These were calculated to a value of £31,200. The Addingham Civic Society, the Olicana Historical Society, Addingham Parish Council and Bradford Diocese all gave their active support to achieve the aims of the project. Local professionals, craftworkers, designers and businesses all volunteered and/or were employed to bring about the successful completion of the project. West Yorkshire Archaeological Services were responsible for the digs. The grant provided for examination of the archaeology of the 8th century burial site; the reburial of bones recovered from previous digs; the dendro-dating of roof beams in the church; stone memorials to be commissioned to mark the burial site; a number of workshops, community events, history trail leaflet and other information materials. All were to be organised and offered for local people, visitors and those walking the Dales Way which passes through the site. Folders containing detailed records of the project can be found in Addingham Library and the Church.